Chinese P2P platform for tour guide services Nilai.com announced the completion of a 15 million yuan ($2.3 million USD) pre-A round of funding on Tuesday. The funding was led by Beijing Fuyuan and will be used to improve the app and enhance the marketing outreach to attract more local guides in overseas countries. Nilai.com, whose Chinese name translates to “Are you traveling abroad (你来出境游)”, is a platform that matches Chinese tourists with local tour guides in other countries. The tour guide sets the price on Nilai.com, which can vary based on different factors, such as car rentals, the tour itinerary, and more. Prices range from 300 yuan to 1200 yuan ($46 ~ $185 USD). “Our local guides speak Chinese and the local language. We do not care whether it is a Chinese or a foreigner. Anyone who is familiar with the local tourism resources or has extensive travel experience and has ability to integrate into the local culture can register as our local guide,” Li Lin, co-founder of Nilai.com, told TechNode. Launched in April 2015, the Beijing-based company has covered 21 countries, 43 major tourist destinations, and 500 local guides. More than 20,000 tourists have used the service, according to Nilai.com. “After the completion of this round of financing, Nilai.com will further enhance the product experience to satisfy different needs of tourists and locals. The platform will still depend on word-of-mouth strategy,” Kim Cho, co-founder of Nilai.com said in a statement. China’s travel service industry has seen intense consolidation over the last year, as Ctrip.com International Ltd. and Baidu-backed Qunar Cayman Islands Ltd. announced a matchup. This January, Alibaba’s travel service arm AliTrip also joined the forces with HanaTour, to bring more outbound tourists to South Korea. “Those tech behemoths have a higher entrance barrier, based on the large user base and capital. While they mostly provide standardized trips, we stand on the vertical field, providing non-standard and customized trips for travelers. In the future, we believe we will also have standardized quality travel services,” Mr. Li noted. 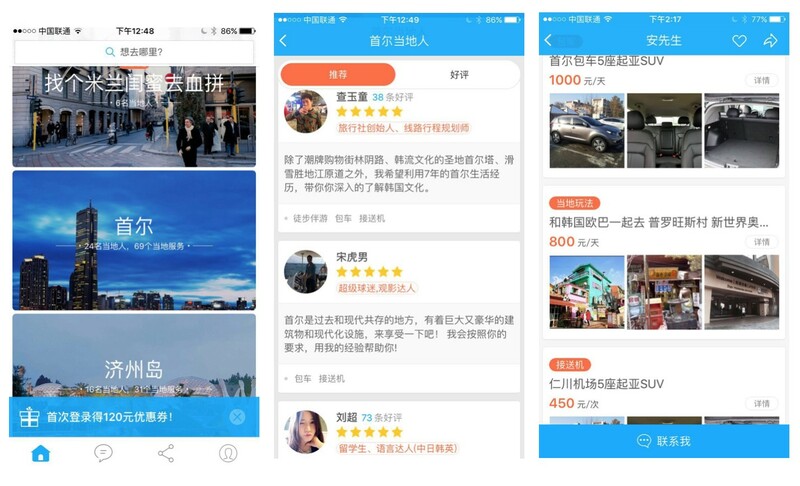 Chinese startups try to provide a niche travel destination to specialize their service and stay competitive, including FishTrip, covering hotel booking in Taiwan and Thailand, iTrip.com, focusing on sports and leisure activities in Australia, New Zealand, Southeast Asia and United States and QUAFRICA, covering trips to Africa. Foreign player Airbnb also plans to offer add-on travel services this year.